Dolphin Blue offers a wide range of products for your business or personal needs. 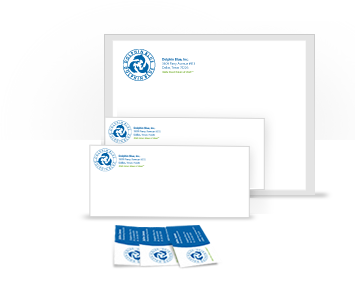 We have business cards, letterhead/stationary paper, envelopes, brochures, and pocket folders all using our recycled and extremely eco-friendly paper. We also have either digital printing or offset printing options available to you, and rest assured our printing is done in an eco-friendly and sustainable manner. Once you select what item you need, our easy guide will take you through to the options. Be sure to have your artwork ready since we'll need that to print your item. We have many different papers, sizes, and weights in the Mohawk and Neenah lines available for printing. We only list the most common on our site to make it easier to order. If you don't have your artwork ready or want something else then that's okay. Just call us at 800-932-7715 and we'll take care of you.